After spending almost 3 weeks on the road driving up the east coast running ahead of a hurricane named Irma, we are pleased to announce a huge selection of Golden to Silver Age comics we've acquired at several locations. We returned with nearly 1000 comics and many keys (Spidey #1, Fantastic Four #1, JIM #83, Strange Tales #110, B&B #28) and hot issues (Golden Age Joker covers, 100 pre-code horror, Timely teen humor, and much more). Although some higher grade and more expensive comics will be sent off to CGC for grading, most copies are going up raw over the next month as we clean up and process this large haul of comics. We will be listing a number of cool and key comics every day over the course of the next month, so check out the "New Arrivals" section each day as comics from this haul will be listed as we process them. WorldWide Comics is excited about these comics and will continue to make the type of effort to acquire collections like this to bring to the comic collecting community, so stay tuned. We are thrilled to announce that we have just purchased an original owner Golden/Atomic Age collection this week. The collection consists of around 1350 comics from the mid 40s to the mid 50s, almost all pre-code. The seller was the original buyer of every comic from the newsstand in the mid 40s until his senior year in high school. After going off to school at the University of Houston, he married and settled in Texas where he managed to find room for these treasures that he could never part with until now at the age of 80. Unfortunately he loved these comics a lot when he was young and the collection is mostly low to mid grade (1.0 to 6.0). 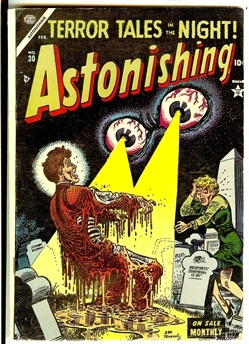 The most exciting part of the collection is the 200+ pre-code horror comics from just about every publisher in the early 1950s and even a few of the hotter cover copies like Chilling Tales, Weird Mysteries, Weird Tales From the Future and just about every Atlas horror title from those years. 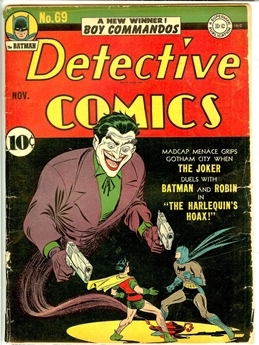 Although he purchased only a small number of superhero comics, he did manage to buy about 8 Joker cover Detective and Batman comics. 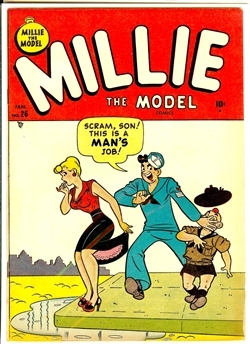 The collection also consists of a small number of western and war comics, and around 500 humor comics with a large number of Four Color and Looney Tunes. Pretty long runs of Lone Ranger and Tarzan fill the remainder of the collection. Because the comics were never bagged and boarded, they vary in grades and conditions. Some have edge chipping and tears keeping them in the lower grades, but all have fairly decent page quality (Off-White or better) with nice cover colors and a decent amount of reflectivity to make them more attractive than their assigned grades. We will be listing the collection over the course of the next month, so check out the "New Arrivals" section each day as 10-20 issues from this collection will go up daily. Some of the hotter copies may get sent to CGC for grading due to their higher values. WorldWide Comics is very happy to have acquired this collection and bring it out to the comic collecting community, it is the most exciting group of comics we have acquired in the past 5 years. Look for us at Chicago's C2E2 Con April 21-23. The convention is at the South Building of McCormick Place in downtown Chicago,IL. We will have two booths so will be bringing a large variety of books from our website. Stephen and Sharon always enjoy seeing our wwcomics customers. Please stop by and say hello if you plan to be attending! Other 2017 Cons for WWC to be attending: Heroes in Charlotte in June, San Diego Con in July, Wizard Chicago Con in August. As we originally posted in 2015, our inventory grew too large too quickly and we busted our image storage. As of October 2015, we changed over to a new storage provider so we should not have problems in the future. However, we had four times more large images of our comics wiped out by our previous provider then we originally thought. We are still slowly adding these images back in, but they all have to be scanned so it will take time. Please bear with us as we restore them. If you need to view a large image, then please let us know and we will get that image scanned for you. One uniqueness of this collection is it came from two brothers who shared, not only in their love of comics, but also shared their collection with each other (something I was not able to do with my siblings) for over 50 years. 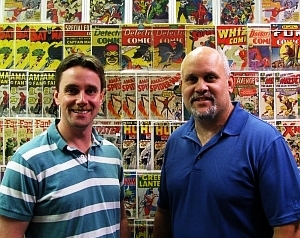 The Boland brothers grew up in Cleveland, Ohio and began buying comics off the newsstand in the early 1960s, the very best time to read comics because that was the dawn of the "Marvel Age". They unwaveringly collected together for nearly a decade before girls and life superseded their childhood interests. However they still continued to acquire comics intermittently, adding to their already vast collection. In the mid '70s the comic bug again attacked the older brother who began to buy and collect regularly for several more years. Even after ending his comic collecting phase of his life, he safeguarded the collection with him in Durango, CO until his passing about 10 years ago. His younger brother then "inherited" the comics and moved them back to Ohio and in with his mother (the comic's original home of record) until she passed a few years ago and he took them to his home inSan Diego, CA, where we found him. The collection consists of around 2000 comics, of which 70% are Marvels, 20% DCs and the rest mostly misc. Silver Age companies. The collection runs from 1963 to 1978, however, continuous runs span from only 1963 to 1969, then again in 1974 to 1977. In those timeframes, the runs are fairly complete. Unfortunately, the older brother appeared to have sold all early keys a decade or two ago as these are inconspicuously missing in the collection (i.e., Fantastic Four & Amazing Spider-Man #1-#6, Avengers #1, X-Men #1, early superhero JIM, TTA, TOS, Strange Tales and even Hulk #180-#182). His brother's response when he was made aware of it, "Good for him, I hope he got good money for them and enjoyed himself with it". That's how you share a collection! 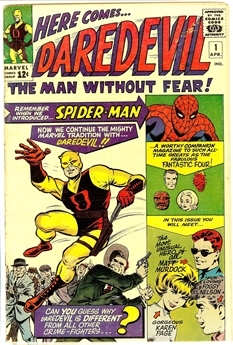 With that said, the only early keys in the collection include Daredevil #1, Avengers #4 and Amazing Spider-Man #14. 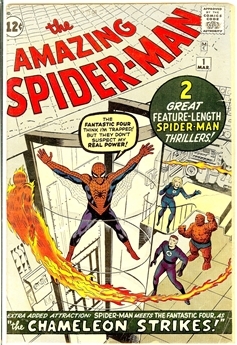 Hot later books like Amazing Spider-Man #39 & #50, Avengers #55 & #57, FF #45, #48, #52 & #67, and ToS #52 & #53 are all included. Fortunately they ended their duel collecting period just after Marvel produced all the #1 issues in 1968, so these are also all present. Though all the earliest issues in the collection are fairly low to mid grade (not surprising considering their age at the time), the comics really get sweet at the end of 1966 and remained that way until 1969. All issues after that time are up and down (mostly down) until about 1976 which then grade consistently high. The books were bagged about 20-30 years ago, but never boarded, so they were protected from the elements, but not as much from handling. The earliest issues have heavy to moderate reading wear (grading 4.0 to 6.0), but the late '60s books have almost no reading wear. In fact the books from 1967-1968 have a near-pedigree quality to them. They lay flat, possess almost no reading wear, have that stiffness as if never read, solid page quality, and super clean covers with great colors and gloss. Grades from this period range from 8.5 to 9.6. If not for the occasional finger dent or corner crease (which likely occurred during the moves), these books would grade 9.4 to 9.8. The Bronze Age part of the collection did not fare as well, they almost all show signs of reading wear, though copies between 1976 to 1978 fared much better, grading out at 9.0 to 9.6. WorldWide Comics is very happy to have acquired this collection and bring it out to the comic collecting community, it is the best original owner collection we have acquired in the past 5 years. We are expecting around 250-350 comics to go to CGC for grading (generally 9.4 or better pre-screens for Silver Age issues). Unfortunately most of these will not be seen for another 6 months due to the grading time. But meanwhile, all other issues will began going up on our site this week. We have begun listing the Daredevil run and will continue with the X-Men and Fantastic Four, while filling in with a bunch of shorter run titles. We have included a slip explaining the collection (recognize, we are not calling it a pedigree which is often overused with comic collections, just a collection of note with the history behind it). Thanks for looking and reading this lengthier than we expected story on this collection. The CBCS case feels rickety, but is still tight and much more durable than CGC cases to cracking. Their case is a tiny bit wider but not as deep (you can fit 4-5 more CBCS books in a box than CGC, so the box weighs 4 pounds more). Grades seem to match CGC at this point, but the sample size evaluated is small. CBCS is considering 9.9 and 10.0 in all tiers, not just the higher priced tiers. This is huge for that market but may result in what some feel can me a glut of 9.9s and 10.0s in the future, time will tell. Submission forms are easier to use and thier tiers match CGC almost one-for-one. CBCS cases seem to avoid the slab damage that CGC cases can experience as the comic is sandwiched between the mylar innner liner and the ends appear to pinch the comic into place, leaving it floating in the middle of the liner. The only problem that may be caused is spine rolling depending on how the book is first encapsulated. The CBCS web-site is not fully active, but the instant insights into the status of your book along with access to all grading notes without being charged will be refreshing once it becomes functional. At this point, we feel a comic graded by CBCS will hold the same grade and therefore the same price as a comic graded by CGC. We are therefore pricing them the same. As we get in more books and as the company matures we will keep evaluating and determining their strengths and weaknesses and hope to feed this information back to them to help them grow. A second grading company in the comic market will only improve the market for all, so we will hope for their success. Better filtering in the search options. A long awaited Want List capability for clients. New information to aid collectors (like the alphabetic/numeric grading scale). Like every software upgrade, we are expecting a few bugs which will require fixing, plus we will be fine tuning the fonts and colors on the site, so please bear with us during this time. This marks the first major change to our site since we launched it in 2008 and we are very pleased with it. Comic Verification Authority (CVA) visited WorldWide Comics in May 2013 and assessed over 4,000 of the 15,000 CGC graded comics in our inventory for the potential of finding those issues that would rate Exceptional for that grade assigned by CGC. These books are identified with a CVA sticker on the CGC case and noted in the "Pedigree/Special Collection" search function as CVA Rated - Exceptional Copy or by pedigree with the notation "CVA Exceptional" after it. CVA Mission. For those who are not aware, CVA is a start-up company in its first year of operation. Their goal is to provide the comic community with an additional layer of evaluation for comics that show outstanding relative eye appeal for the grade assigned by CGC. In a nutshell, they are identifying the top tier in that grade based upon such eye appealing features as structure, centering, glossiness and overall appearance. Their service is focused on higher end comics and for the pickiest of collectors. That collector who takes pride in knowing he not only has a 9.4 of a certain issue, but one that would cherish the idea that he owns one of, if not the best looking 9.4 graded. WorldWide Comic's View. In our opinion, what CVA can provide to the comics community can become another essential tool to buying and selling high end comics. At this point, we feel the auction houses can benefit the most from their services and any auction house that does not use their service in the future is only shorting their clients. ComicLink is the first to adopt CVA into their auctions, hopefully more will come. Matt Nelson is off to Florida to do GREAT things at CGC!!! Although it saddens our hearts to lose the best comic partner there is in the business today, we at WorldWide Comics were surprised but very pleased that CGC persuaded the co-owner of our company to help lead them to the future. In the years we have spent devising the concept of the Pedigree Book (which will be finished) and creating WorldWide Comics, Matt has proven himself to be one of the few comic specialists with the integrity, expertise and knowledge that I would have wanted to partner with. CGC could not have selected a better person to help lead them at this time. We realize that a few people will look at his arrival at CGC in a negative light, but we know it will elevate CGC to higher levels. We are expecting great things for the market with Matt helping take the most pivotal company in the comic collecting world to new heights. Thanks for the the years you spent with us Matt. Welcome to a new decade in comic collecting! Comic books saw a tremendous surge the past ten years, thanks to a perfect storm of the internet, CGC, and online auctions. We expect this decade to be no less interesting. 2010 closed out with the economy in a severe slump and comic prices for Silver and Bronze greatly impacted by this. After a year in which most comic prices saw a continous downward trend, we have been greatly encouraged with what we are seeing in 2011 with prices not just finally stabilizing, but actually increasing again (maybe not like in 2008 and 2009, but still increasing). Given the interest Hollywood keeps generating, plus endless TV shows, cartoons, merchandising, and the general consensus that being "geeky" is actually cool these days, you can bet comic books will be around for a long time. The bottom line is whether you're collecting or investing (or both), enjoyment and relaxation is the name of the game, and people just can't get enough of that these days. You can count on Worldwide to continue to provide you some of that enjoyment in 2013! First off, we generally receive around 500 to 1,000 new comics from CGC each month, including a slew of high grade Silver and Bronze, and choice copies from the Golden Age. Also, over 1000 new raw comics are generally added each month, including many from new pedigrees like Savannah, Twin Cities and other collections. And to stay on top of our game we're even checking much of our old inventory, updating prices according to new market trends, which means some books are being reduced in price. These will periodically appear in the "new arrivals" section of our site. WorldWide Comics is planning to set up at several big shows in 2013, including San Diego, both Chicago shows, and the New York show, and most likely a few more smaller cons throughout the country. As usual, we'll have our killer inventory on hand, so make sure to visit our booth if we're in your neck of the woods. We also have many new developments for the website, which will appear throughout the year, including a "Want List" and a "Make an Offer" function. WorldWide Comics Has Moved Back to Texas !!! On August 8th, 2012 WorldWide comics moved its operations to San Antonio where we will be located temporily at Quail Whisper while its permanent facilities are being prepared (we expect 3-4 months). We are now fully up and running in San Antonio after a trying move sandwiched between San Diego and Chicago Cons and topped by Stephen and Sharon's wedding in November. Sorry for any delays or errors made during this transition. WorldWide Comics is estactic to announce the complete consignment of a stunning collection from one of the great comic collectors in the field for the past three decades. We have been receiving many high grade Silver Age Marvel and DC comics from this collection in the past year with 1000s still at CGC right now, so tune in every week to see what else we get back. We're proud to present two high quality collections to our customers, the Golden State Collection and the Peter Kuper Collection . The Golden States are actually a collection that originally came to market in the early 90s, but the owner held back a portion, which we now have for sale. Peter Kuper is a renown illustrator who has published work not only in comic books, but also Mad Magazine, Time and Newsweek. Peter's childhood collection of Silver and Bronze Age are being offered exclusively here at Worldwide throughout the summer. The Golden State collection was amassed by a meticulous collector residing in the San Francisco area who carefully filed away his newsstand copies each month. The core of the collection ranged from the early 60s to present, but also included a very impressive run of Golden Age as well. The owner finally decided to part with the Golden and Silver Age portions of his collection in the early 90s, and much of it entered the market through a national dealer. Unfortunately much of the Silver Age was never documented as the Golden State collection, although one can still find random CGC graded issues floating about. The average grade of this period was 9.4 and 9.6, truly amazing books. Fast forward to 2008, the original owner has finally decided to sell the remainder of his collection, which consists of late Bronze Age to present. WWC is proud to offer this last section of the Golden States to collectors starting this week. Just about every single title and issue from Marvel, DC and most 80s independents are there, with the vast majority grading CGC 9.8. 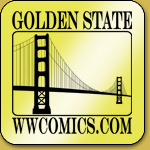 WWC will be releasing over 5,000 CGC graded Golden States throughout the rest of 2009 and early 2010. Each book will display a Golden State sticker on the CGC case. Grab your want lists and hold on! 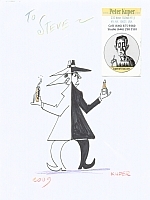 Any fan of Mad Magazine knows the exploits of Spy vs. Spy, the wordless comic strip featuring two spies, one black and one white, constantly warring against each other. 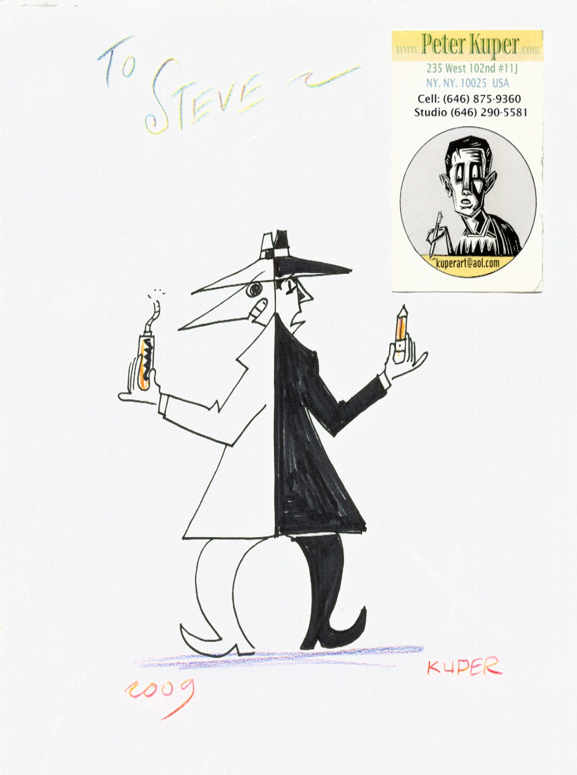 Peter Kuper, who has been drawing Spy vs. Spy for Mad during the past 12 years, began his prolific career in illustration with a love of comic books. This passion blossomed into comic book work alongside greats such as Howard Chaykin, Bernie Wrightson, Mike Kaluta and Jim Starlin, eventually leading Kuper to create a number of autobiographical comics and the renowned political comix magazine World War 3. Kuper also boasts a number of covers published for Time and Newsweek. He has taught courses in comics and illustration at the School of Visual Arts in New York, and is also an art director of INK, a political illustration group. During his comic collecting heyday, Kuper amassed a collection of about 2,300 comics from the 60s and 70s, which included near complete runs of Marvel and DC. The peak condition of the collection ranges from 1972 to early 1975, which have yielded a plethora of 9.4, 9.6 and 9.8 grades. Worldwide is proud to present the Peter Kuper collection for sale, of which 1,000 will be CGC graded. Look for their listings throughout the month of July and August. Good luck this year, and happy hunting!